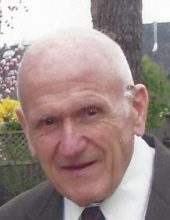 Zimmermann, John (Hans), 93. gave his soul back into the hands of the creator on September 25, 2018 at his home in North Arlington..
Born in Neuwied-Heimach (Germany) in 1925, he was the son of Georg Zimmermann and Gertrude née Schley. He was predeceased by his brother Joseph, his beloved wife Rita née Gehring after a happy marriage for 37 years, and his son Thomas who died at age 48 this July from Multiple System Atrophy (MSA). John was the adored grandfather (Opa) of Katie, Jill, and Allie, the beloved father in law of Suzanne née Rittberg, and the dear uncle of his niece Margret and her husband Manfred in Germany. After being forced to serve in the German army during World War II John became a prisoner of war and was stationed in Fort Campbell, KY. He emigrated to the United States in 1953 where he settled in Jersey City, NJ and became a proud United States Citizen. After he got married John moved to North Arlington, NJ. After graduating from Accredited Evening High School in Jersey City, he received his undergraduate degree in accounting from Seton Hall University in South Orange, NJ and his Graduate degree in Spanish literature from Montclair State University in New Jersey at the age of 83. John was an auditor with Emigrant Savings Bank in New York City for 30 years retiring in 1993. He was also a teacher of German language from 1969 to 1989. John was a member of the Holy Name Society of Queen of Peace Church and the Nutrition Center, both of North Arlington. Visitation will be from the Parow Funeral Home, 185 Ridge Rd, North Arlington, on Tuesday, October 2nd, from 9:30 AM to 11:30 AM thence to Queen of Peace Church North Arlington, for the funeral mass at noon. The internment will follow at Holy Cross Cemetery, North Arlington, NJ. In lieu of flowers donations in John’s memory would be appreciated to either: MSA NJ, P.O. Box 773, Howell, NJ 07731 (or www.msanj.org) or the Benedictine Mission House, 1123 Road 1, Schuyler, NE 68661 (or www.christthekingpriory.com). To send flowers or a remembrance gift to the family of John "Hans" Zimmermann, please visit our Tribute Store. "Email Address" would like to share the life celebration of John "Hans" Zimmermann. Click on the "link" to go to share a favorite memory or leave a condolence message for the family.